NEW SALE PRICE: $9.95 with FREE SHIPPING!!! When does cod fishing peak? Where can you catch big stripers on June’s full moon? 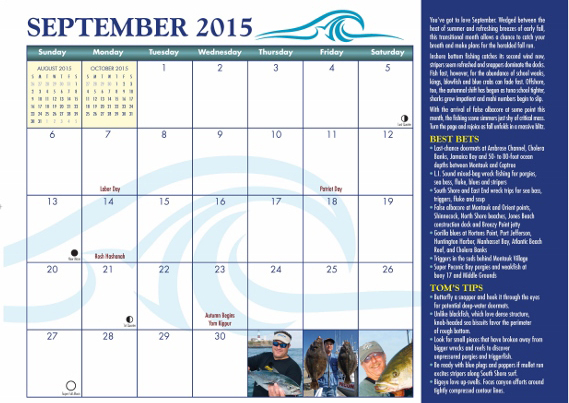 What color bucktails fool late summer fluke? Are the trout stocked yet? 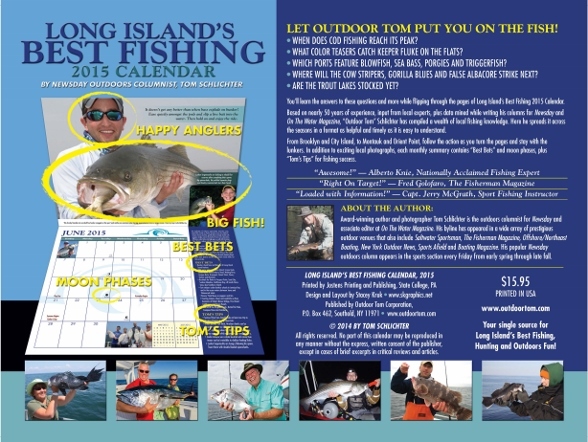 You’ll find answers to these questions and more while flipping through the glossy pages of Long Island’s Best Fishing 2015 Calendar, by Newsday outdoors columnist and On The Water associate editor, Tom Schlichter. 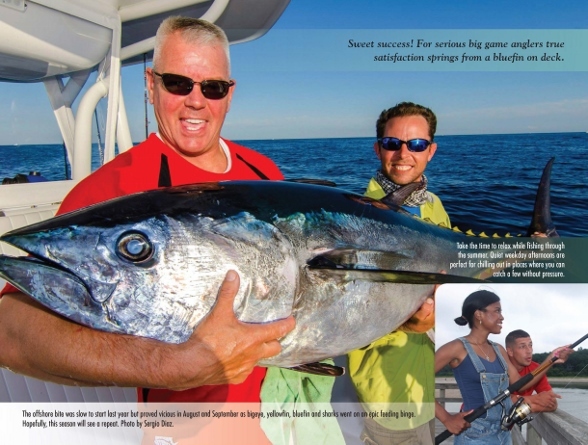 Big and beautiful, this 9” x 12”, high-quality glossy calendar is loaded with the first-hand fishing information anglers crave throughout the year – making it a great holiday gift for fishing friends and family. Better still, the 2015 edition features $30 of open boat, fishing station and cHarissa spice coupons for a great, low price of just $9.95. Based on nearly 50 years experience, input from local experts, plus data mined while writing his Newsday and On The Water columns, “Outdoor” Tom Schlichter has compiled a wealth of local knowledge. Turn the pages and watch patterns develop from Brooklyn and City Island to Montauk and Orient Point. 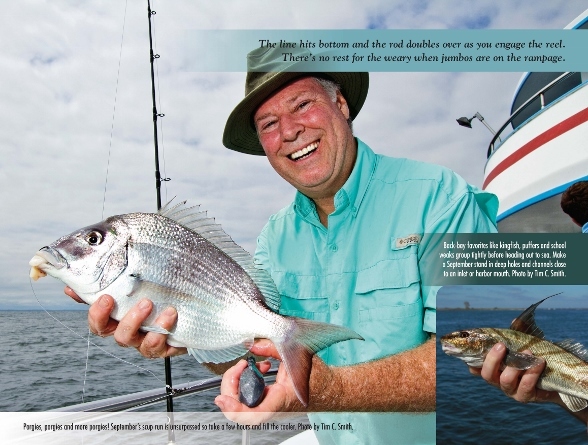 Detailed information covers all local saltwater and freshwater species, boat, surf and ice-fishing, plus bait, lures and flies. 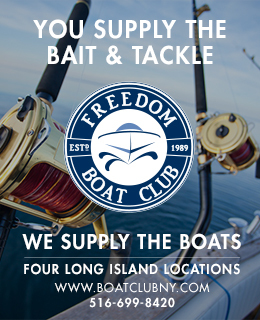 Specific targets include codfish, fluke, striped bass, blackfish, bluefish, weakfish, false albacore, tuna, shark, winter flounder, porgies, sea bass, blowfish, blue crabs, trout, largemouth bass, pickerel, walleye, white perch and more. 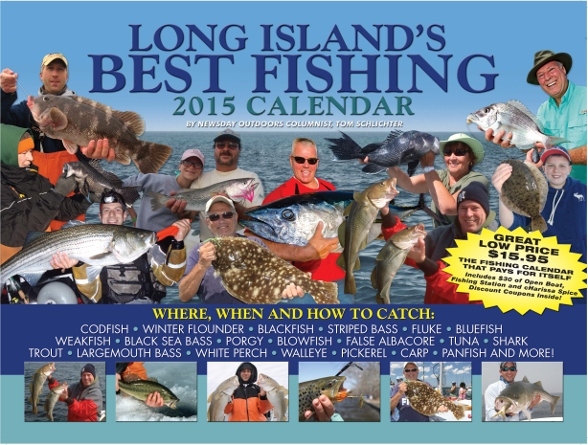 You can order Long Island’s Best Fishing 2015 Calendar here online, or find it in select tackle shops and book stores. Copies can also be ordered by mail at: Outdoor Tom Corporation, P.O. Box 462, Southold, NY 11971 ($12 includes tax, postage and handling).